Karen began practicing Ashtanga Yoga in North Carolina as a way to help relieve the stress of graduate school. The set sequence of the Ashtanga practice was particularly appealing to her as it became a relaxing meditation unto itself. After moving to Blacksburg, Karen began practicing Hot Yoga at In Balance. Wanting to deepen her personal practice and explore the healing benefits of yoga, she completed a 200 hour Satsang Foundational Yoga Teacher Training Certification in May 2015 through In Balance with Courtney Barr and Amy Gallagher. She followed with a Restorative Yoga Teacher training with Colleen Dwyer. Karen concentrates her practice on Hot Yoga, complimented by a variety Yin Yoga classes. 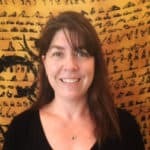 Karen wishes to make her classes welcoming to yogis of all ages and levels, encouraging students to modify poses to meet their needs on the yoga mat, allowing the mind, body, and breath to connect and relax.